WONDER WORDS: The author is among the writers featured in the new Kunapipi, out now. As part of the year-long celebrations to commemorate the 25th anniversary of the Poetry Society of Jamaica, their monthly fellowships at the Edna Manley College's Ampitheatre are being dedicated to recognizing the stalwarts who've contributed immensely to the literary excellence that Jamaica has become known for. 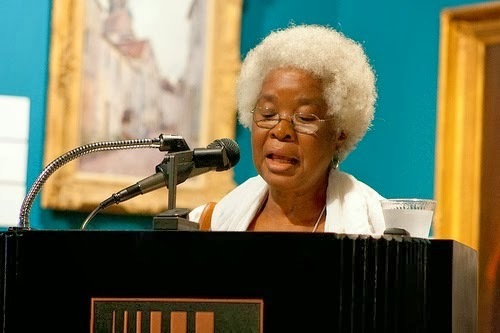 And who is more worthy of recognition than Dr. Erna Brodber, the iconic novelist, sociologist and edutourism pioneer who graced the podium this past Tuesday night to read from works new and old. TALLAWAH: Tonight you read your new short story "The Babyfather" for the first time in Jamaica. Was it written to mark a special occasion? Brodber: Yes, it was was, and I enjoyed reading it here. I was asked to contribute a piece for [the latest edition of the] Kunapipi journal. So I wrote it specifically for that. Readers everywhere generally have nothing but glowing praise for your storytelling prowess, and your most recent release, The World is a High Hill (Ian Randle Publishers), is certainly another triumph. How do you stay inspired? Most of the time it's a case where I just happen to have the time, and [the major themes] are ideas you think you think about all the time. If you live life you must reflect on it, and when you reflect on it, sometimes you're surprised by what you come up with. I have lived life as a therapist, as a case worker, and people talk to me, so I know certain problems that people have, but I don't always know how their stories end. But in writing my book I had time to reflect on how the story should end. So there are real-life stories that I don't know how they end, but as a writer, you have to create your own endings. What has been the single greatest contributor to your success? I suppose living where I live, down in the [St. Mary] country. It's good for reflection, and coming from the family that I come from, I never lacked for encouragement. Did you study any of the masters growing up? I didn't do English at university, but I had a very good experience in sixth form [at Excelsior High] that transformed the way I felt about books and literature. And as they say, the rest is history. When all is said and done, what do you know for sure? Bwoy, I don't know anything for sure (Laughs). How can you? I really don't, except that I give thanks for all that has happened to me. I've been around for a long time.